Season flour with sea salt and black pepper. Cut eggplant into 8 equal size discs. Toss eggplants in flour to fully coat. In another bowl, whisk eggs. Dip eggplants in the egg mixture making sure to get it fully coated. Roll eggplant discs in bread crumbs (make sure to get a thick coating). Line eggplant discs in a single layer in a lined baking sheet. Bake for 20 minutes, turning eggplant over halfway through cooking. Remove from the oven. This looks so crispy and delicious. I have to admit, I have NEVER made Eggplant Parmigiana before. But your recipe and photo have now convinced me that I MUST! I was never a fan because it was always mushy. I like to taste all the different components of food in a dish. I made it simple, and the way I used the marinara enables the eggplant itself to remain crunchy. It's really good! I have never made Eggplant Parmigiana before, but this looks so tempting, so I'm noting it... A perfect summer dish- love it, Mia! Wow, Mia! That is absolutely gorgeous! I pinned it on Pinterest to save for later. Thanks for sharing at Church Supper. We love eggplant! Any time. Thanks for sharing my food with your friends!! 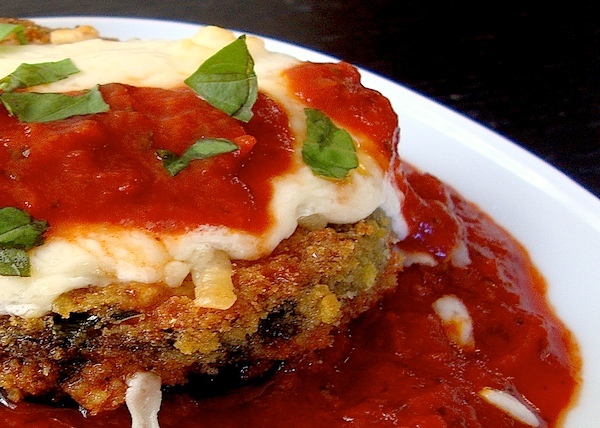 I love Eggplant Parmigiana...this one looks great! Would love to have you link up to Turning the Table Thursday sometime. Oh and I stumbled your post...hopefully it brings in some viewers!